Burger King's Philly Cheese King Sandwich is based loosely on the popular Philly Cheese Steak Sandwich. Available for a limited time, the new burger is comprised of two grilled quarter pound (before cooking) beef patties topped with melted sliced American cheese, caramelized onions, and American cheese sauce, on a sesame seed bun (also available on a sourdough muffin). When it comes to Philadelphia Cheesesteaks I lean toward Geno's version of the classic sandwich consisting of thinly sliced steak, Cheez Whiz, and grilled onions on a hoagie roll. Apparently Burger King shares my taste. Rather than trying to recreate the classic, Burger King has designed a double cheeseburger which delivers the same flavor profile. The two beef patties were seasoned more boldly than the average Whopper patty. The extra seasoning did help the burger stand out. The American cheese and the cheese sauce worked together to provide a good hit of cheese taste and a creamy mouth feel like one would get from Cheez Whiz. 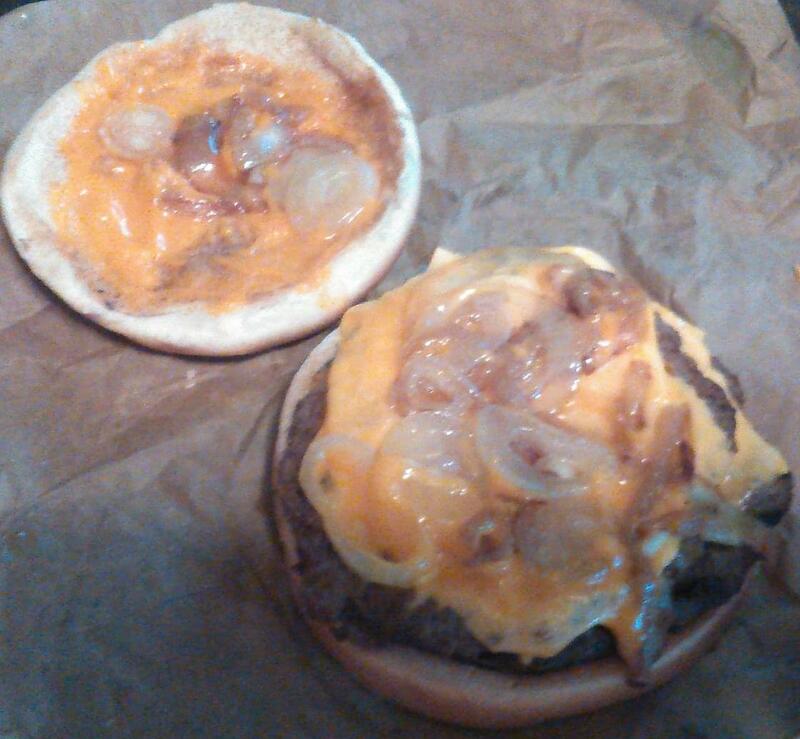 I have to say, I'm glad I ordered the fries instead of onion rings because Burger King was not stingy with the grilled onions on my sandwich. As you can see in the photo, the thing was LOADED with sweet grilled onions, which added to the flavor without overpowering the other ingredients. The official description lists a "toasted sesame seed bun." The bun may have been in a room with a toaster at some point, but it really wasn't toasted. Nevertheless, it was a fresh sesame seed bun. If they hadn't claimed it was "toasted," I wouldn't have mentioned it at all. If I had to rate the sandwich on flavor alone, I would give it 9 out of 10 stars. However, there is one big drawback to the burger. It costs $8.00 all by itself. I can go to Red Robin and get a good double cheeseburger with bottomless steak fries for $6.99, and I can order a Long Island Iced Tea to go with it. If I order this burger I have to pay extra for the fries and then no liquor to be found. This is a good fast food burger, but it's not worth $8.00. The whole point of fast food is that it's quick, cheap, and tasty. THIS BURGER AIN'T CHEAP! All things considered, I have to give Burger King's Philly Cheese King Sandwich 6 out of 10 stars.